ABS-CBN News Chief Ging Reyes accepting the United Nations Department of Public Information silver award. 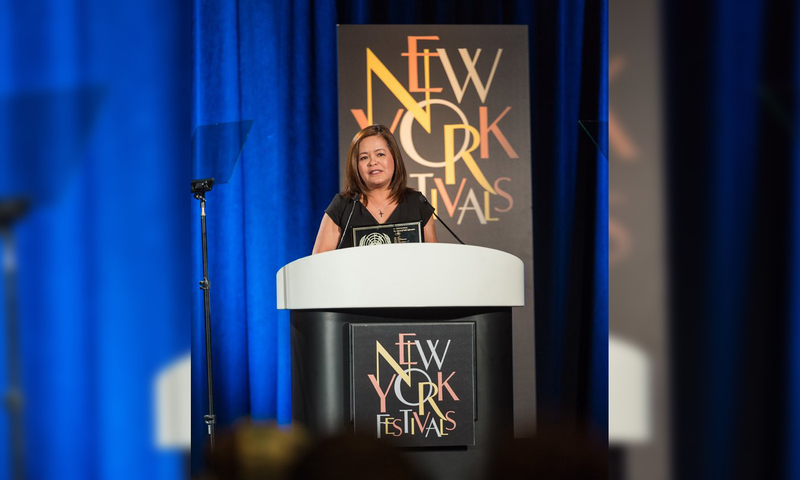 Aside from GMA Network, ABS-CBN Corporation has also been honored at the recently concluded 2017 New York Festivals “World’s Best TV and Films” competition. The Kapamilya Network's documentary Warmer, which looked into the threat and impact of climate change as documented by Atom Araullo, won a bronze medal in the climate change and sustainability category. As determined by a special jury convened by the United Nations Department of Public Information, the documentary, which aired last year on the ABS-CBN News Channel, also received the UNDPI silver award. "Thank you once again to the New York Festivals for this recognition. I accept this on behalf of my team led by Atom Araullo and Hera Sanchez. We are just so privileged to have done this project," said ABS-CBN Integrated News head Ging Reyes in her acceptance speech. "We are a long way to go from really truly raising awareness with climate change and its impact all over the world. But this project was a very good start." Reyes, who was accompanied by ABS-CBN Global reporter Bev Llorente, was a co-presenter at this year's awards ceremony along with other prominent media executives and international journalists, namely NAB Executive Vice President of Conventions and Business Operations Chris Brown, CBS Sports' Ken Aagaard, Clayton Conservani and Carolina Barcellos of Brazil's TV Globo, Jo-Ann Demers and Martyne Bourdeau of Radio-Canada, Lee Camp of RT America, and Camilla Ziedorn of TV4 Sweden. Other ABS-CBN productions that received finalist certificates from the prestigious award-giving body were "Lando's Wrath" by the late-night newscast Bandila in the Best Coverage of a Continuing News Story category, “Typhoon Lando” by TV Patrol in the Best Newscast category, and ANC's Mukha in the current affairs category with its episode "Serbisyo." According to its website, The New York Festival's World's Best TV and Films competition honors programming in all lengths and forms from over 50 countries. A silver from the UNDPI and a bronze medal from the #nyf! Couldn't be prouder of @atomaraullo, @herasanchez and team for this recognition. They were the creative and editorial minds behind the documentary "Warmer," which looked into the impact of #climatechange. The flooded areas of Malabon, the rich marine life in the Verde Island passage and the snow-covered mountains and fjords of Norway provided a rich backdrop to this story. Catch the replay tonight on @ancalerts at 8 PM! With my co-presentor at the #nyf awards ceremonies, Camilla Ziedorn, journalist from TV4 Sweden.